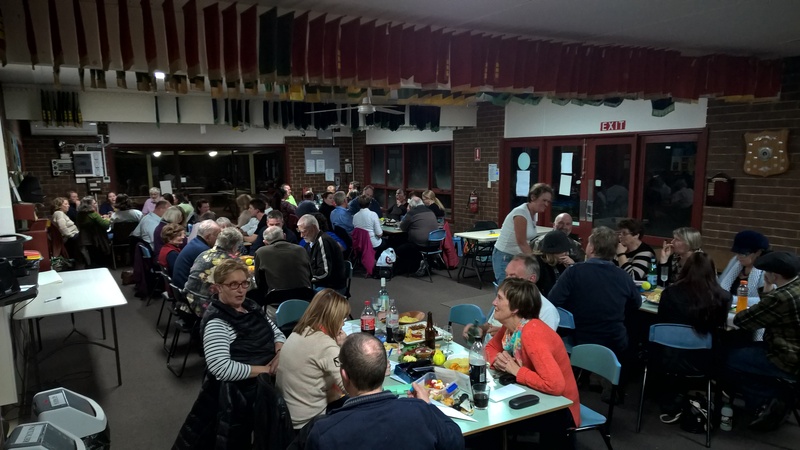 Back in the early seventies, the Ringwood East Baptist Church Tennis Club was approached by the Ringwood Council to ascertain if the Club was interested in establishing, with Council support, a public club at the Peter Vergers Reserve. 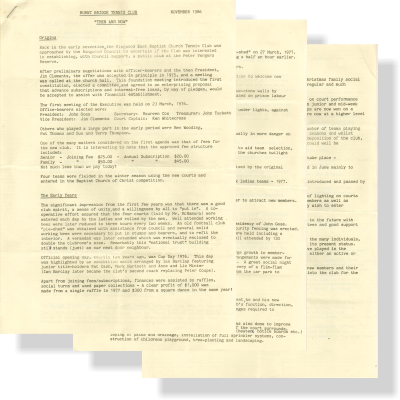 After preliminary negotiations with officer-bearers and the then President, Jim Clements, the offer was accepted in principle in 1975, and a meeting was called at the church hall. This foundation meeting introduced the first constitution, elected a committee and agreed to an enterprising proposal that advance subscriptions and interest-free loans, by way of pledges, would be accepted to assist with financial establishment. Others who played a large part in the early period were Bev Wooding, Pat Thomas and Sue and Terry Thompson. Not much less than we pay today! Four teams were fielded in the winter season using the new courts and entered in the Baptist Church of Christ competition. 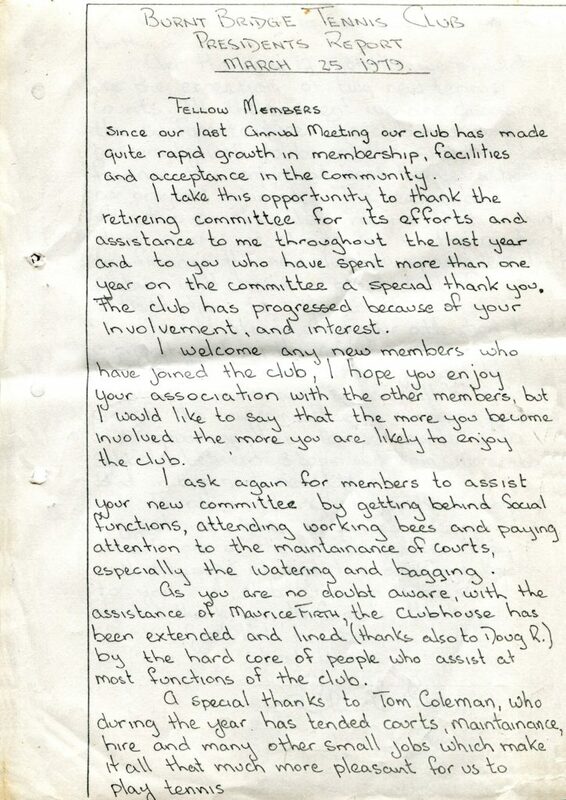 The significant impression from the first few years was that there was a good club spirit, a sense of unity, and a willingness by all to “put in”. A cooperative effort ensured that the four courts (laid by Mr. McNamara) were watered each day by the ladies and rolled by the men. Well attended working bees were later reduced to three hours every two weeks. An old football club “pie-shed” was obtained with assistance from council and several solid working bees were necessary to put in stumps and bearers, and to refit the interior. A verandah was later extended which was eventually enclosed to double the clubroom’s size. Remarkably this “national trust” building still stands (just) as our next door neighbour. Official opening day, exactly ten years ago, was Cup Day 1976. This day was highlighted by an exhibition match arranged by Ian Barclay featuring junior title-holders Pat Cash, Mark Hartnett and Anne and Liz Minter (Ian Barclay later became the club’s second coach replacing Peter Coupe). Apart from joining fees/subscriptions, finances were assisted by raffles, social turns and used paper collections – A clear profit of $1,000 was made from a single raffle in 1977 and $300 from a square dance in the same year! First general meeting of B.B.T.C. was in the “pie-shed” on 27 March, 1977. This was preceded by the R.E.B.T.C. annual meeting a half an hour earlier. Keys to courts were restricted to committee members. 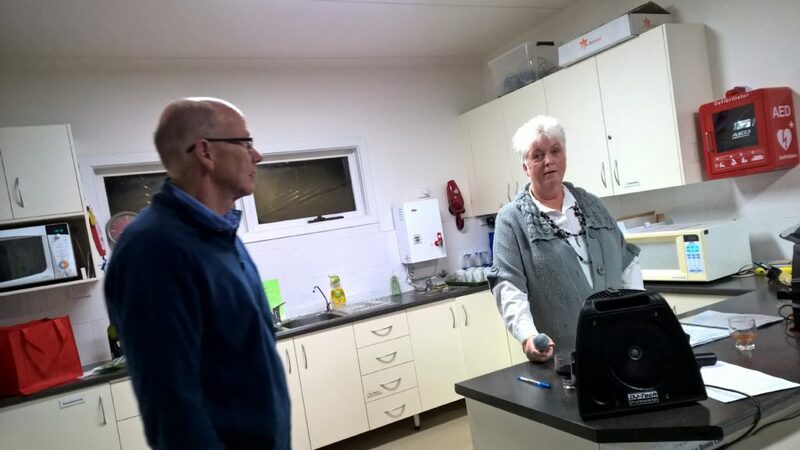 Pat Thomas was appointed as the first liaison officer to welcome new members and to inform them concerning club rules. Umpires stands were collected from behind the blue-stone walls by Harry Thomas. These were obtained very cheaply based on prison labour at the magnificent sum of 50 cents per day. Annual social matches were arranged at Pentridge, under lights, against the Prison Officers and their wifes. No levies were necessary for working bees. Billy Brown did all the dangerous work but was usually in more danger on the tennis court! 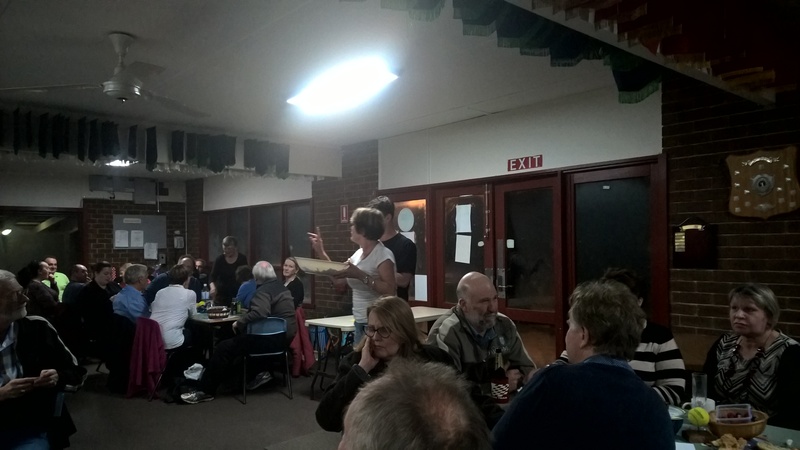 A challenge board was introduced for singles play to aid team selection, and to assist members who were playing singles in the churches twilight competition. Court 2 and part of Court 1 were ripped up and raised by the original contractor. First teams entered in E.M.R.L.T.A. – two mid-week ladies teams – 1977. Total membership as at February 1978 was 160. Club provided exhibit at Ringwood Day 1978 in order to attract new members. 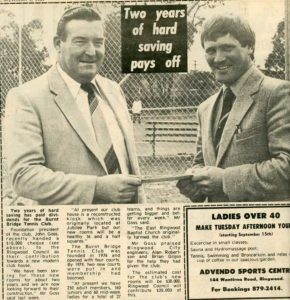 1980 was a busy year for the club still under the Presidency of John Goss. Two new courts were constructed (Mr. LeLevre) and security fencing was erected. 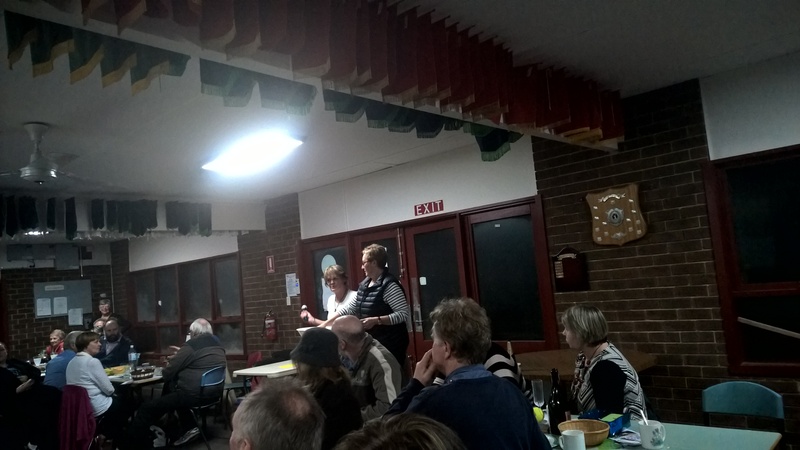 Many successful social and fund-raising activities were held including a presentation night at the Villa Borghese which was well attended by 130 members and friends. 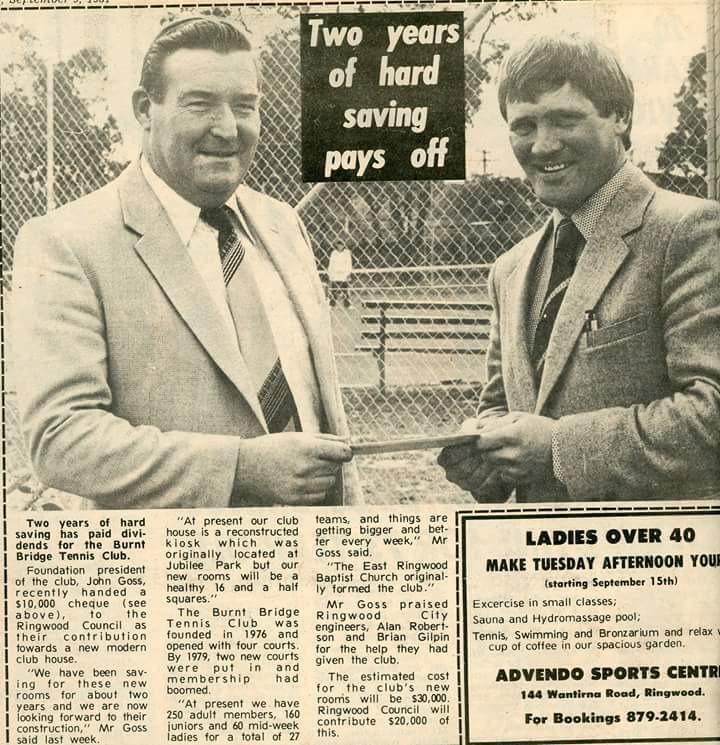 With a healthy bank balance of $19,000 in 1981, a large growth in membership, and loan assistance available from council, arrangements were made for construction of our present clubrooms (Maurice Firth). 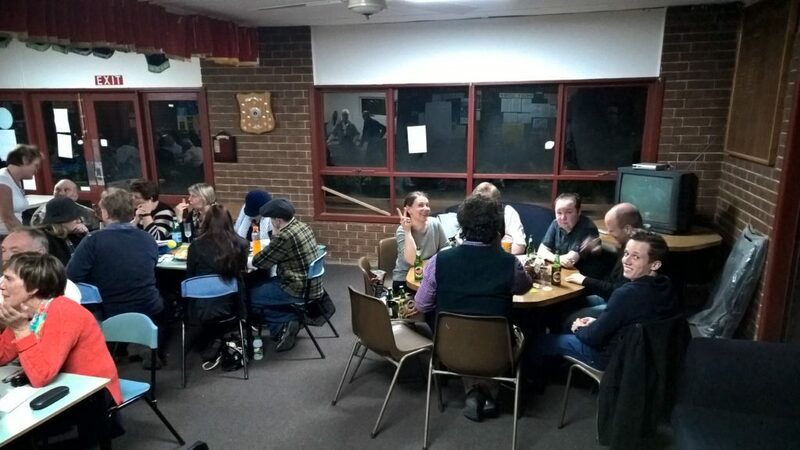 A great social night was held for the official opening, highlighted by delivery of a flim-flam telegram from a girl who trudged ankle deep in mud from the car park to make her grand entrance. Something from the archives. 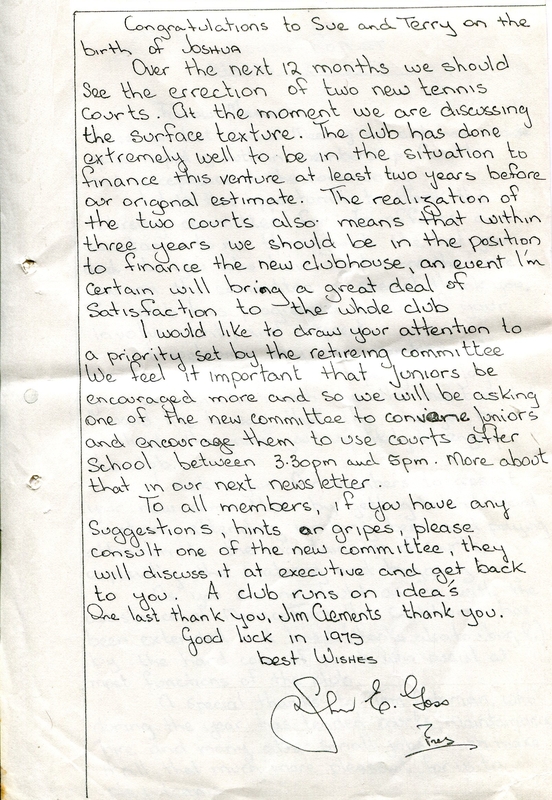 Cook bookl created by the club in the 1970’s. Following the appointment of Brian Anderson as President, he and his new committee undertook a detailed examination of the club’s function, direction, and re-unification. They implemented the several changes required to give the club an improved professional standing. During his and that of John Kunkel, much was also done to improve usability of the suitability of the clubrooms and beautification of the court surrounds. These included such things as fittings for the rooms (heaters, notice boards etc.) laying of paths and drainage, installation of sprinkler systems, construction of children’s playground, tree-planting and landscaping. Social activities were fairly infrequent although the Christmas family social day and attendance by Father Christmas each year was a regular and much appreciated event. The club in recent years has very much strengthened its on court performance with greatly increased numbers of teams being entered in junior and mid-week ladies competitions (M.A.L.T.A. & F.T.G.). Premierships are now won on a regular basis and the grades being obtained for teams are now at a higher level than those of earlier years. There has however been a corresponding decline in the number of teams playing in the Saturday afternoon competition for the past four seasons and whilst this is not of great concern, because or’ the changing composition of the club, a growth in members, particularly u1′ t’ainily membership could well be accommodated. In line with other progressive clubs we incorporated in June mainly to protect against public liability. Revised and modernised Constitution and Rules were introduced and passed by the General Meeting. The club has obtained planning permit for erection of lighting on courts 5 and 6 in order to improve the opportunities for members as well as providing a facility for the local community who may wish to enter competition teams. We can after our first ten years of history book forward to the future with confidence, thanks to the efforts of hard-working committees and good support from general membership over many years. In any paper such as this it is difficult to single out the many individuals, committees and events, which assisted this club to reach its present status. We can however, all feel justly proud of the part we have played in the formation and growth of the club whether it has been in either an active or supportive role. However, what we must do in the future, is to encourage new members and their kids, not just to play tennis, but to put something back into the club for the sport and social benefits which they receive. 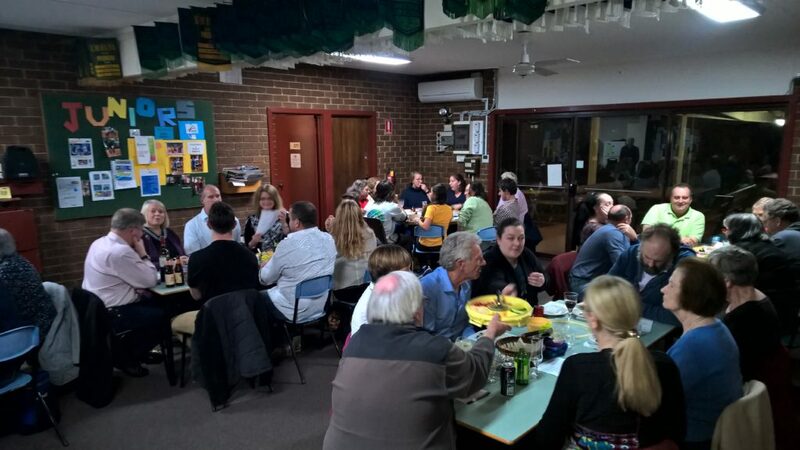 The Trivia Night held on 16th July 2016 was a great success both socially and for fundraising. Sixty club members and their families and friends thoroughly enjoyed the night. 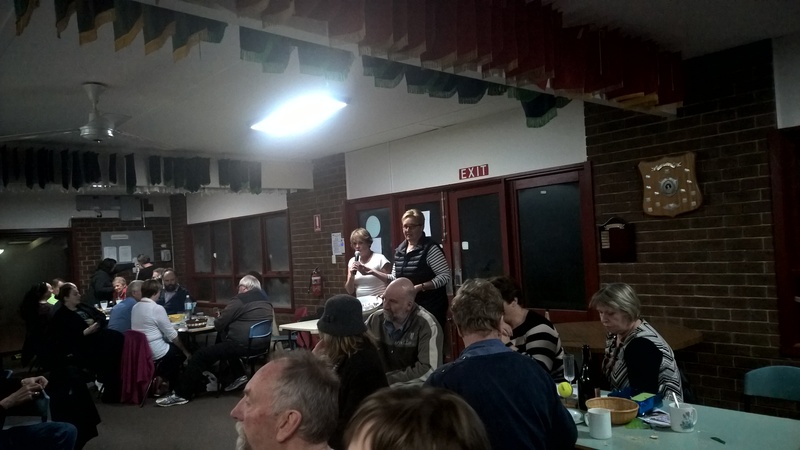 The entertaining Trivia competition was run with flair by Glenda and David Nicholson (many thanks to them both for their hard work in organising this) and was won by the 40 Loves table hosted by Club members Jan Kennedy and Bev Bencina with family and friends. 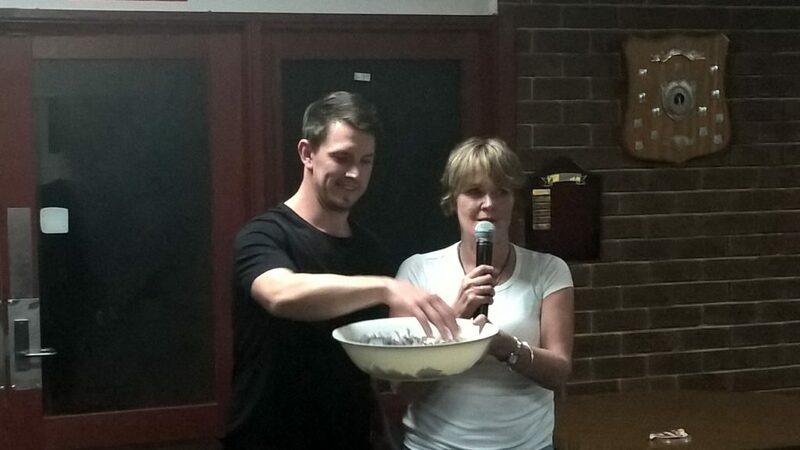 Over $900 was raised for club projects from attendances and raffles. Prizes were donated by committee members and a number of local businesses listed below. Local MPs, Michael Sukkar and David Hodgett; Club Ringwood; Kublai Thai Restaurant, Burnt Bridge; Burnt Bridge Pharmacy; Burnt Bridge Newsagency; Coles Supermarket, Burnt Bridge; Scotsburn Nurseries; Sofia’s Restaurant; La Porchetta, Croydon; McDonalds Croydon; North Ringwood Gym. Many thanks to all who attended this event and helped make it such a success and look out for our next Fundraiser to be held on a Sunday afternoon on November!